Women in Media @wimballybunion don’t fare well with criticism, so they blocked me on #Twitter last night. Please RT this to them to convey my utter surprise and bewilderment. Posted in Misc and tagged Bertie Ahern, Women In Media at 10:42 am on February 21, 2019 by Bodger. Have you considered getting a life? Twitter is no place for men. Twitter: Stasi for the Angry Birds (pun intended) generation— Stuart Lee. Being blocked by Terfs is an honour. Who gives a fiddlers?!? Blocked on Twitter…call the cops. The previous ‘Bertie at WIM’ post did well yesterday, so me thinks this is BS trying to drum up further clicks. To be expected. I feel a bit dirty giving out about this though. I was the first one in there yesterday. Mentioned Sarah Carey and everything. I’m also not a fan of Bertie. But while some admittedly well known media types attend, this is a small enough event, in a small town where anybody vaguely famous would be welcomed because they bring in a bit of cash. People got to eat etc. I wonder if all this attention on BS and Twitter might prove to be useful advertising in that regard. More tickets might be sold, to people who want to see a spectacle. I suspect they may be slightly disappointed. Some spectacles can be surprisingly mundane. Sarah Carey’s screed about “christian values” is the most embarrassing attempt at rehabilitating De Man of De Peeeple. They know they’ve messed up over giving Bertie publicity (and a shed load of money in a brown envelopes for his fee.) but won’t back down. Sarah Carey, who lied to a Tribunal. No wonder forgiveness is high in her agenda. Now writing for the Sunday Times. Imagine. Great headline, thought it was about Mildred’s family commitments. Amazing the way the Wikipedia page on corruption in Ireland gets longer and longer. Yet less and less is reported in the thought control outlets that masquerade as a free press in this state. Yet its not even the bigger picture, but its the details that really grate – such as the grubby tax exemption Ahern got for the supposed autobiography that was ghost written by then UCD lecturer, Richard Aldois. How much will he get for this nixer? Onto his 3k pension per week, paid courtesy of the Irish taxpayer. 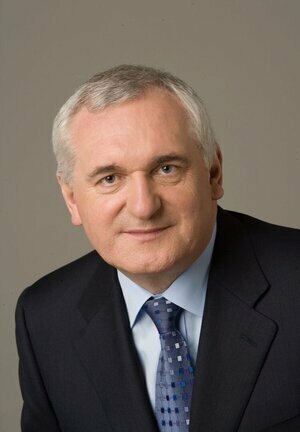 Mr Ahern should fit right in with anybody who wishes to portray fairy tale publishers as a free press. How much is Bertie making from his post-politics business “Ecne Consultancy & Conflict Resolution Unlimited Company” ? I keep seeing Bertie cropping up all over the world earning what must be significant speaking fees. Why has Bertie got an unlimited company? An unlimited company allows him to avoid revealing financial records. He hasn’t changed, has he. Hopefully it’s mistaken for Acme, and Bertie is arrested for illegally selling firearms, explosive and other lethal material to a Mr WE Coyote and reckless conspiracy to murder a Ms R Runner. Regardless, if the company is unlimited, Bertie keeps the finances hidden from prying eyes.